The climate movement and trades union movement need to come together to stop repressive corporate/state spying. One area less covered by the recent openDemocracy report into state surveillance of activists is blacklisting. This is the practice of gathering information on workers – through surveillance, vetting and other means – on behalf of employers, in order to deny employment to those who take part in trade union activities. The practice is particularly prevalent in the construction sector and has had far-reaching and devastating consequences for thousands of workers, many of whom had done nothing more than attend trade union meetings as members. In 1993, a company called The Consulting Association was founded to run an industrial-scale surveillance operation on thousands of construction workers. The company sold the information it gathered to 44 construction companies, including Balfour Beatty, Carillion, Laing O’Rourke, Sir Robert McAlpine and Skanska. In many cases, this information included trade union affiliation and activities, alleged political affiliations and activities, and details of personal relationships. Many files contained comments or opinions about workers’ apparent political standpoints, including explicit instructions not to employ particular workers. The Consulting Association was not the first company to do this; The Economic League operated a blacklist for over 70 years before it disbanded. Many of the practices in The Economic League were adopted by The Consulting Association, and key staff members moved from the former to the latter. 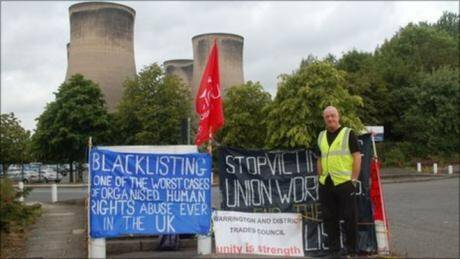 It is difficult to understate the appalling consequences of blacklisting. Many workers were forced to leave the construction industry, or suffered years of unemployment. Some had their homes repossessed; saw their marriages end and suffered physical and mental health problems. Some workers had files on them that dated back over forty years. Many suspected blacklisting but were never able to prove it; others had no idea, and only learned of the practice when they were informed of it in 2009, after the Information Commissioner’s Office (ICO) carried out a raid on The Consulting Association’s offices. In May 2016, unions UCATT, Unite and GMB finally won compensation of £10m for 256 workers. But the consequences of the blacklisting scandal are also important for the activist movement as a whole to consider, because many of the practices undertaken in order to blacklist workers were used against activists organising around climate change, globalisation, animal rights and other issues. During the raid of The Consulting Association’s offices, the ICO obtained documents indicating that the police were colluding with construction firms in order to blacklist workers. The ICO seized notes detailing a meeting between Detective Chief Inspector Gordon Mills from the National Extremism Tactical Co-ordination Unit (NECTU) and the Consulting Association, less than 6 months before the Consulting Association was raided and closed down. In a statement to a parliamentary meeting in 2015, whistleblower Pete Francis accused Mark Jenner of being an undercover officer who was deployed to infiltrate UCATT union in the 1990s, posing as a construction worker. Francis said, “please let me state very clearly that Mark Jenner was 100% one of my fellow undercover SDS police officers deployed alongside me in the 1990s.” The SDS was the same police unit that deployed Bob Lambert and John Hines who later went on to form romantic relationships with animal rights activists Helen Steel and Belinda Harvey. Later, the SDS became the National Public Order Intelligence Unit which deployed Mark Kennedy to spy on climate activists. Similarly victims of blacklisting – who are overwhelmingly working-class men – might feel unable to participate in arrestable direct action protests, which are the “public face” of the climate movement (think shutting down power stations, or the Reclaim the Power camp during which the MP Caroline Lucas was once arrested). Working class people can’t fall back on family wealth or cultural capital once they obtain a criminal record: there may be the impression that working class trade unionists have more to lose from breaking the law and are therefore less likely make connections with climate activists. There is also a social power differential between the contemporary climate movement, which is (in my experience at least) dominated by middle class people, and the victims of blacklisting, who are working class. In 2014, the social mobility government advisor Peter Brant wrote that working class people need to “become more comfortable with middle-class social setting such as restaurants, theatres and offices if they are to succeed.” The implication of Brant’s statement is that middle class culture is superior (it is the working class who need to change to succeed), and it is certainly middle class culture that is embraced by most people in power. This power dynamic means certain activist movements, by being too homogenous in class terms, are effectively creating spaces that working class people cannot inhabit. As the comic Paul Merton said of his experience of entering a rowing club as a young man, “I felt so inhibited by them, I couldn't go any further on. I had to go back. These rowers and stuff – this is it, this is the thing – not feeling you fit in. I didn't feel as if I fitted in. Feeling that you shouldn't be there. That somebody's going to tell you off.” Of course, these feelings of not belonging would only be exacerbated if working class people attempting to join certain movements are subsequently accused of being undercover police officers. This work must be expanded as the Pitchford Inquiry into undercover policing continues. It is only by working together to expose the scale of police intrusion and surveillance can its victims hope to obtain justice – especially as the police have repeatedly declined the opportunity to be transparent about the activities of the SDS and the National Public Order Intelligence Unit, even as whistleblowers come forward to reveal details of the units in the public domain.